It’s no secret that Iceland is fast becoming one of the most popular places on the planet. 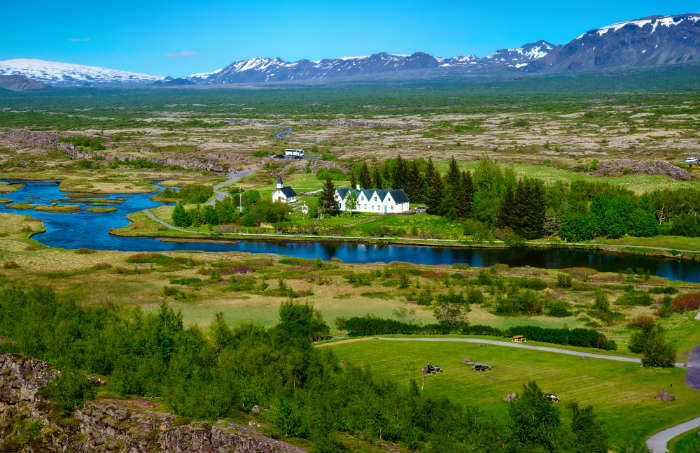 With the jaw-dropping mountain scenery, thermal pools that are oh so relaxing and a capital city that is well known for its fun attitude, is it any wonder that visitors are making the 3-hour flight over to Reykjavik, the gateway to Iceland? It’s also easy to explore the world’s most northerly capital and its surroundings in a long weekend, if you fancy a quick break away. So here’s how to spend 3 days in Reykjavik. This might not seem quite right but on your first morning in Iceland, and in a “3 Days In Reykjavik” guide, we’re actually going to say don’t go into Reykjavik straight after you land. It’s probably really early in the morning, more than likely you’ll be tired and chances are, your hotel won’t even be ready to check you in. So, the perfect solution is to head straight to one of Iceland’s most popular destinations, the Blue Lagoon. 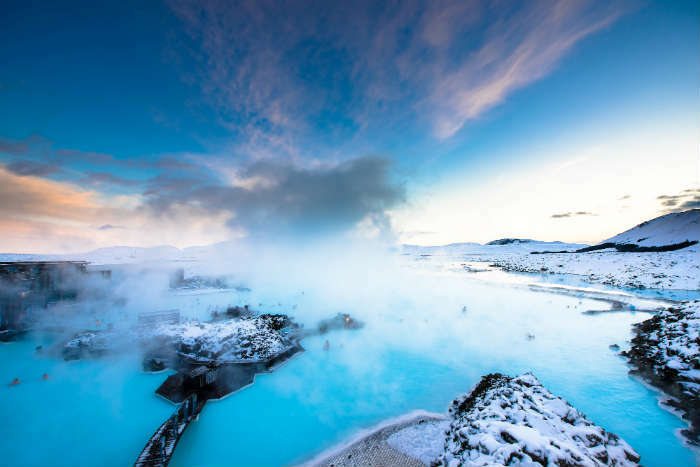 Conveniently, you can pre-book a coach journey that will take you straight to the Blue Lagoon from the airport and then onto Reykjavik later on in the day. There’s even luggage storage here for your suitcases! We can’t think of a better way to start a relaxing holiday in Iceland than by relaxing in the gorgeous blue pools of water. Food and drinks are also available here with some of the favourites being sushi or warming soup. Once you have soaked your muscles and softened your skin with a silica mud mask, hop back on the bus into Reykjavik where you can check into your hotel and freshen up before taking a walk around the city. 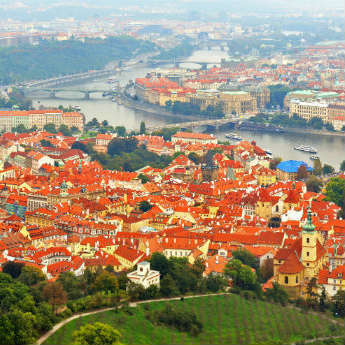 You can get on a sightseeing bus if you want to get your bearings but this city is very walkable if you fancy stretching your legs. A City Walks Map will show you all the highlights of this small city including the towering Hallgrimskirkja Church. 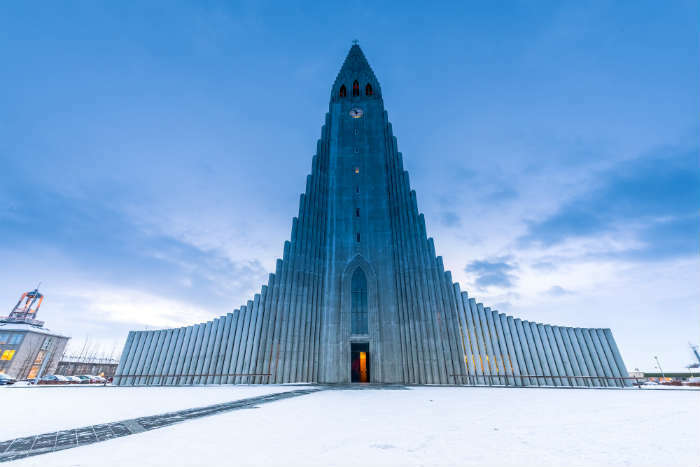 October to May, this striking building is open until 5pm but during the summer months it’s open until 9pm and it’s worth going to the top of Hallgrimskirkja to see some amazing views of Iceland’s capital city. After seeing the views, you can take a walk through Downtown Reykjavik, which is one of the main shopping districts. However, it’s down by the harbour where you can see the hub of Reykjavik’s activity. 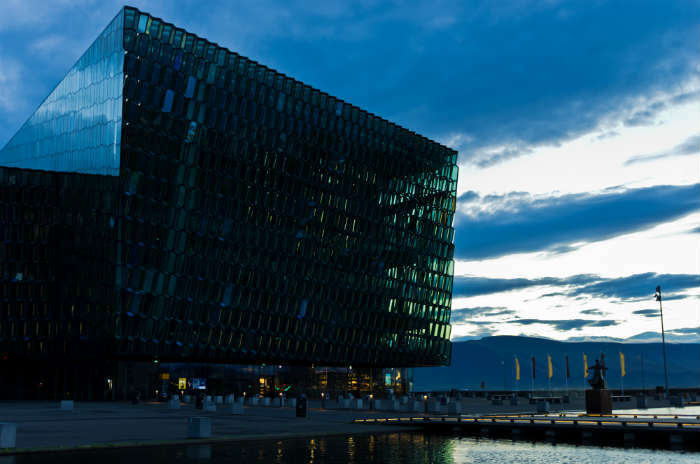 With plenty of restaurants and cafes here to while away the hours, it’s a great place to spend the afternoon especially with the new Harpa Concert Hall creating a new landmark on the city’s landscape. This is also where you can get one of the cheapest and most popular meals in town, the Icelandic hot dog. Made mainly from lamb, with a bit of pork as well, this American dish is eaten all over the country and is regularly asked for “all in” – just be prepared for a hot dog overload that may leave you wanting to go back for more! Head back for an early night as tomorrow is the day for a big tour around some of Iceland’s most well-known spots! After what was hopefully a good sleep from all the fresh air, day 2 is the day for the legendary Golden Circle Tour. Again, it’s not directly in Reykjavik but as the city is only small, most people use Iceland’s capital as a gateway to the rest of the country. 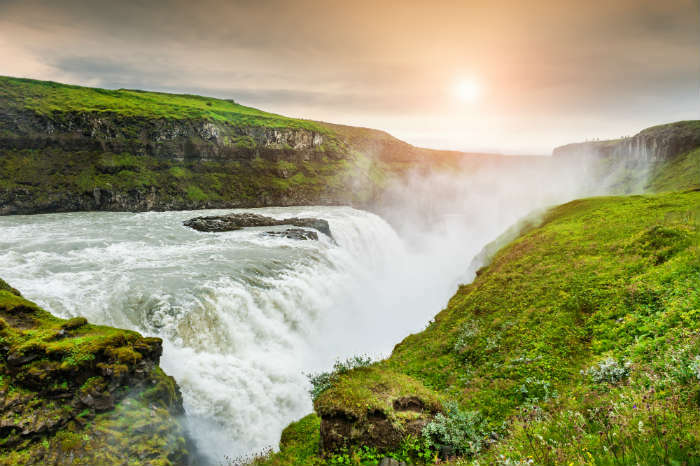 Tours are easily accessed here and the Golden Circle Tour takes you through the mountains, to the waterfalls and the erupting geysers that will take your breath away! If you prefer to do things your own way rental cars are easily available so you can take your time at each point. 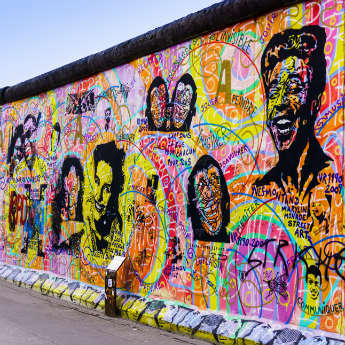 However a tour gives you information about all the places you visit and you’ll more than likely get to here a few funny stories from the tour guide too. Stop off and say hello to the friendly Icelandic Horses before making the first stop of the day at Thingvellir National Park. This huge expanse of land is home to the tectonic boundary between the North American and Eurasian continental plates – pretty cool if you’re into your geography. If you’re into scuba diving, you can also swim in between these plates, technically meaning you’re swimming in between two continents. Next up, you’ll visit Geiser where, you guessed it, you can see a spectacle of geysers erupting from the ground. This is where you’ll find Great Geysir and Strokkur, another geyser which erupts regularly, around every 6 minutes. There’s no doubt you’ll be amazed by these columns of hot water that shoot up to 30 metres in the air! The last stop of the day is Gullfoss or Golden Falls. With water tumbling down 32 metres of rock, this cascade is one of the most spectacular in Iceland. In summer, you may see a rainbow across Gullfoss’ mist and in winter, the water may be frozen in some parts. So whichever season you visit Gullfoss in, you’re guaranteed a sight to remember. When you’re back in Reykjavik, and if it’s a Saturday, tonight is the night to go out and try a few of the bars that give Reykjavik its legendary reputation for enjoying a good night out. Everywhere is within walking distance in Reykjavik so don’t think you’ll have to get taxis everywhere to hop from place to place. The biggest concentration of bars is around the shopping street of Laugavegur and they don’t often close until 5am on a Saturday – perfect for any party animals out there! 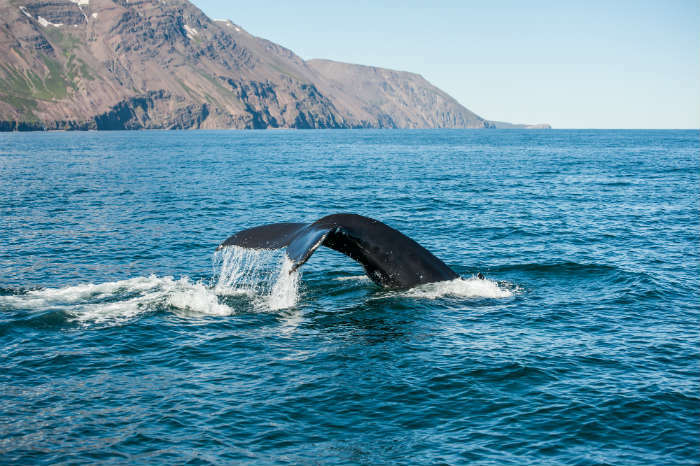 Before you head back home and away from the magic of Iceland, hop on a boat from Reykjavik’s Old Harbour and go whale watching for the morning. Sightings aren’t guaranteed but these elegant creatures do frolic around the waters quite frequently so sightings are fairly common. Humpback whales and dolphins are the most popular creatures to be spotted but there are around 20 different species of whale to discover in Iceland’s waters. 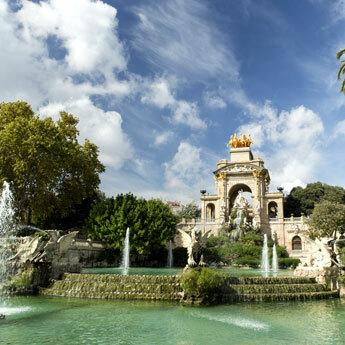 Tours usually last for a couple of hours and are a definite must if you’re into your wildlife. Back on dry land for the afternoon, this is the time to pick up some souvenirs for back home. Reykjavik’s shopping streets of Laugarvegur and Skolavordustigur are the places to shop in cute little boutiques, art galleries, Icelandic jewellery shops and clothes stores. Anything with an Icelandic winter theme – socks, jumpers or scarves – are a great way to take a bit of Iceland back home with you. Make the most of your last night by going out to the country side to try and catch the northern lights. 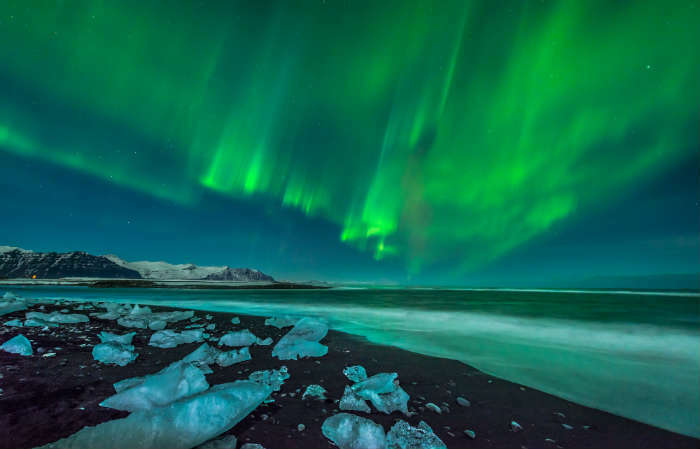 These elusive colours darting through the sky are one thing on most people’s bucket list and you have to get out of Reykjavik to have a good chance of seeing them. Winter is the best time to see the Northern Lights as the dark nights give people a better chance of seeing them but you may catch a glimpse even in the summer if you’re lucky. Whatever time of year you go chasing the Northern Lights, make sure you wrap up warm!